Even if a business card is just a small piece of thick paper that contains basic information about a person, business cards are actually critical and vital for the development of every single business, be it big or small. Business cards are what you hand to your investors, prospects, and customers. Business cards are also a personalized way of marketing your company where you have the power to decide you are going to design your business card. And because of these “small piece of thick paper”, you are able to provide a lot of opportunities to the people working for you as well as promoting your business in a more artistic manner. So basically, a small business card that contains the basic information of a person such as his full name, title, and logo of the business. It also indicates the person’s connection with his or her business. Business cards are what we have to give to a client, a potential customer, or even to a prospective investor. Despite having the standard size of 2 inches by 3 inches, a business card should be able to convey the image of your business within this standard dimensions. Sounds difficult, right? But to make it easier for you, you have to ensure that your business card will be able to present a professional image that people will surely remember. That means that the color, the proper and effective wordings, the texture of the paper, and the images used on your simple business card are meticulously chosen so that you will be able to achieve the professional image that you desire. Even if business owners like you have been told to not attempt to design your own business card by yourself, you shouldn’t be bothered about it especially if you are cash-strapped and should deal the matter with your own hands rather than spend an extra cash for something you can possibly do. One simple way that can help you in creating your own business card design is by simply studying and even scrutinizing all of the business cards that you have received. And of course, you could also make use of templates that can totally help you get started. 1. Establish a best logo and use this as the basis of your overall design since you should also make it as the largest design element on your business card. 2. Keep your business card design simple and do not cram too much information on it to the point that it can already be too overwhelming. 3. Just include the essential information such as your name, title, company name, address, phone, and fax numbers and e-mail address. Also, keep in mind that your best business card is not your resume. 4. Choose a font or typeface is easily readable by everyone. 6. Make sure it’s easy to read. Since you hand clean business cards when you would introduce yourself to other people, this makes business cards a vital element in creating a favorable and impressive first impression. By having not only an attractive and eye-catching business card but also a luxury business card that contains all the relevant contact information about you, you can definitely get a hold of the attention of your prospects and this can even help you become so memorable even after your initial meeting. Business cards can also help you gain and enhance your credibility because those who hand out business cards are seen as someone who has a sense of professionalism. 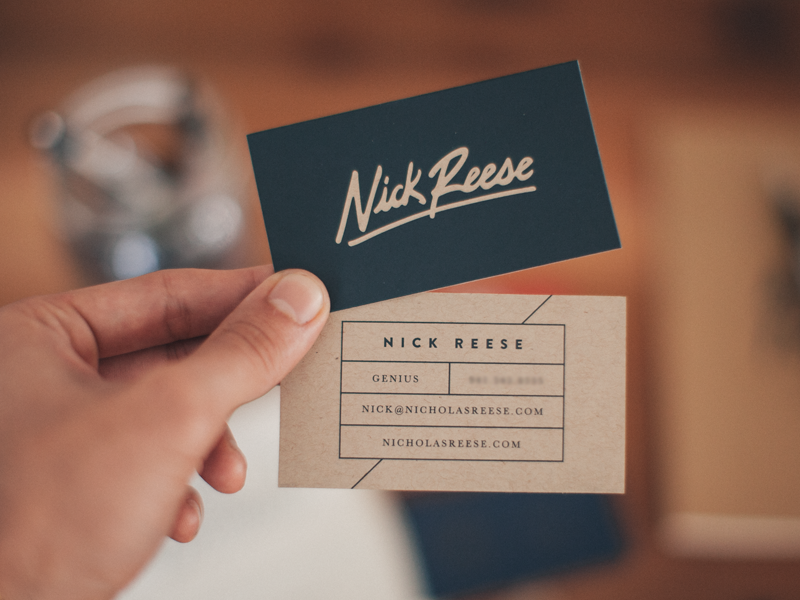 Did you know that business cards can actually help you in establishing your brand? Yes, it does and this also makes your company or business even more easily identifiable by a lot of people– this means more possible prospects! Even by simply making your modern logo as the largest and the main design element of your business card, you are already reinforcing and advertising your brand and identity without you constantly conscious about it. Despite its standard small size, fashion business cards are actually capable of doing bigger things for you. How? By providing your clients and prospects your relevant contact information and giving them choices of ways where they can easily contact you. We all know how important communication is in our lives and of the fact that it should be the foundation of every strong relationship– the same goes for you and your clients or prospects. How can your prospects make deals and collaborations with you if you do not provide a way or medium where they can contact you? Sure, they can always pay you a visit but also keep in mind that they could be businessmen and women and that they do not have the leisure of extra time in their hands. With a professional business card that you could easily hand to your prospect, you are opening yourself to more opportunities that are vital for the growth of your business. Even if business cards are relatively small objects, it can actually be a factor in the success of your company’s marketing plan. It can work along with your other existing materials, such as your company’s official letterhead design and official envelope design, that can help in portraying your company’s values. Speaking of competitors, you may be fully aware that your clients and prospects are also receiving business cards from your competitors. You might think that you should be alarmed about this but no, you should not be as long as you have a smartly designed business card that can be a great factor in making you stand out among the rest of your competitors. Yes, what you have just read is true and this also means that you no longer need to make pointless and cliched gimmicks as your last resort because all you need is a concise but visually appealing card that projects your company’s brand or identity effectively. We hope that the importance of modern business cards have been thoroughly explained to you with the help of this article. Enjoy creating your own business card!